Understanding how natural values persist in anthropic landscapes is essential to assure biodiversity sustainability. Riparian mammals are suitable models to address animal persistence as they face multi-cause anthropic influences: ecological (agriculture, forestry and livestock productions affecting riparian integrity and surrounding habitat permeability) and environmental (pathogenic agents influencing human and wildlife health). 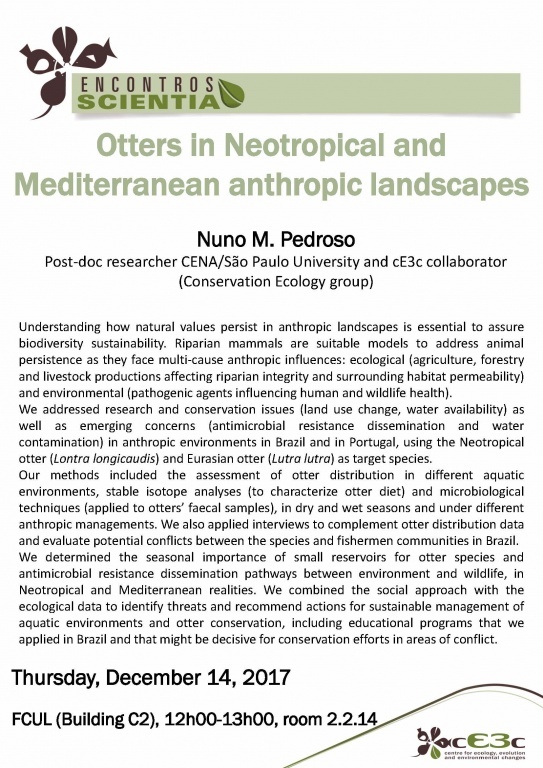 We addressed research and conservation issues (land use change, water availability) as well as emerging concerns (antimicrobial resistance dissemination and water contamination) in anthropic environments in Brazil and in Portugal, using the Neotropical otter (Lontra longicaudis) and Eurasian otter (Lutra lutra) as target species. Our methods included the assessment of otter distribution in different aquatic environments, stable isotope analyses (to characterize otter diet) and microbiological techniques (applied to otters’ faecal samples), in dry and wet seasons and under different anthropic managements. We also applied interviews to complement otter distribution data and evaluate potential conflicts between the species and fishermen communities in Brazil. We determined the seasonal importance of small reservoirs for otter species and antimicrobial resistance dissemination pathways between environment and wildlife, in Neotropical and Mediterranean realities. We combined the social approach with the ecological data to identify threats and recommend actions for sustainable management of aquatic environments and otter conservation, including educational programs that we applied in Brazil and that might be decisive for conservation efforts in areas of conflict.